In this chapter, the steps required to set up an SMS gateway will be explored. Once configured, you will be able to send text messages to individual contacts and mass mailing lists within CiviCRM. 1. Click "Submit and Get API ID" to generate an API ID, and on the next page, make a note of it. 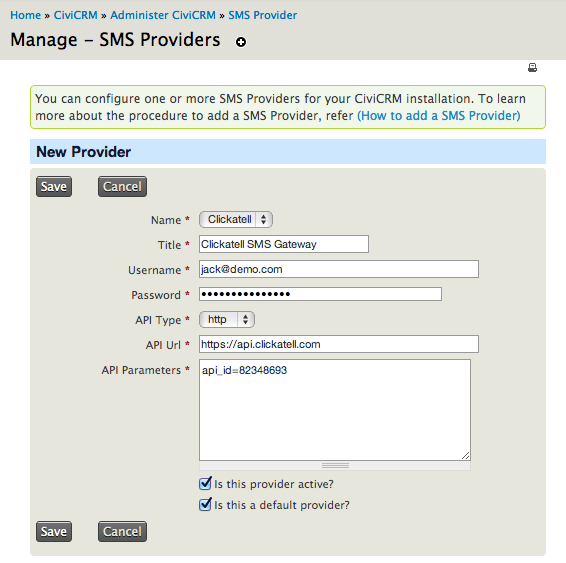 You now have all of the information needed to configure SMS in CiviCRM. To continue, return to CiviCRM and go to: Administer > System Settings> SMS Providers. Click "Add New Provider". 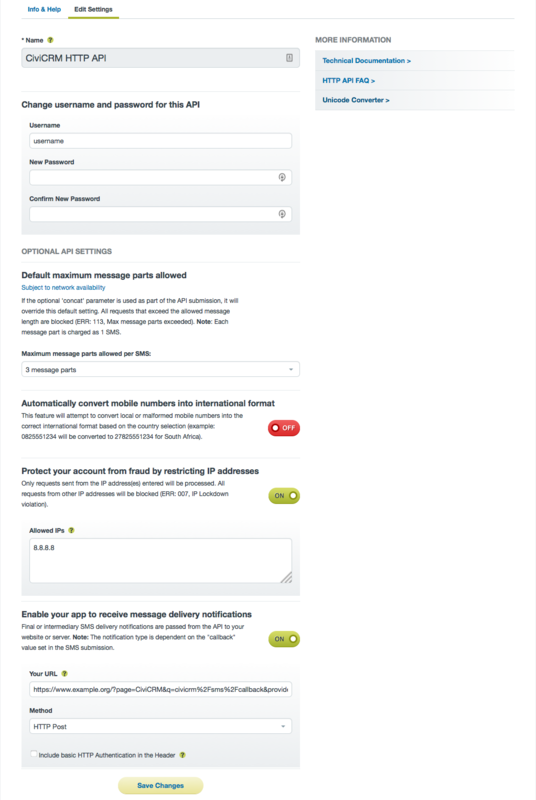 CiviCRM will now be configured to send text messages to your contacts. Thanks for testing Clickatell's gateway coverage. You will be able to change the content of your message after your initial purchase of message credits. Once you have upgraded your Clickatell account, you will need to change a few parameters to get things working again. In CiviCRM, go to: Administer > System Settings> SMS Providers and click Edit on your "Clickatell" provider. In the API Parameters box, under the api_id line, add a from= and a mo=1 parameter. The from= number is the phone number associated with the api_id in your Clickatell account. Twilio offer a wide range of communications and telephony services in most countries. CiviSMS uses the "Programmable SMS" feature. You can register a free trial account, which will allow you to test the service. Once you have registered for an account, you will be asked to verify your phone number via SMS or call. You will then be taken to the Console. Your trial account entitles you to a free rented Twilio phone number, which you can use to send SMS. However, free accounts must verify a phone number before it can receive SMS. For the purposes of this guide, we will send a message to the same phone number you verified in the registration step. From the Console homepage, click the Programmable SMS product. Click the red Get Started button. Click the Get a number button, near the top of the page. A phone number will be suggested to you. If the country of the number is not accurate, use "Search for a different number". Otherwise, click Choose this number, and Done, after noting down the number. You now have a rented phone number that can send and receive SMS messages. Click the All Products & Services icon, in the far left navigation bar. Click your new number from the list to set it up. Under the "Messaging" section, change the "A message comes in webhook" to the following, replacing example.com with your CiviCRM installation. This will send any replies that your messages receive back to CiviCRM. In the Twilio Console, go back to the Console homepage. Copy down your "Account SID" and "Auth Token" (you will need to click the token to reveal it). You now have all of the information needed to configure SMS in CiviCRM. 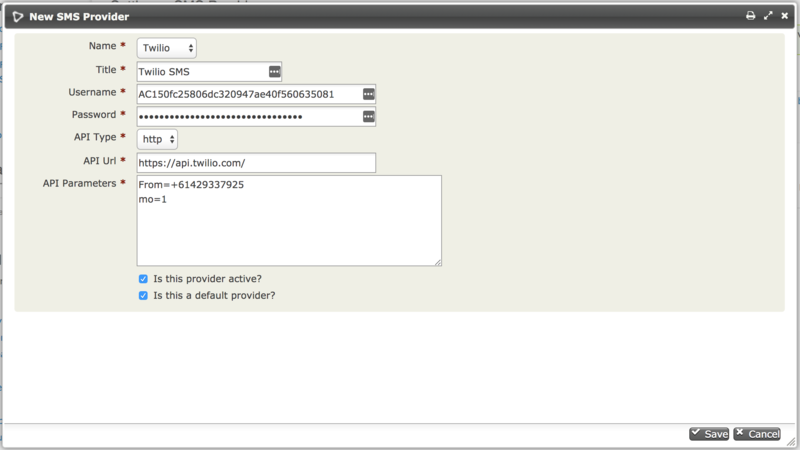 Now that you have a Twilio account with a phone number, it needs to be set up in CiviCRM. Go to CiviCRM and go to: Administer > System Settings> SMS Providers. Click Add New Provider. API type: leave as "http"
API URL: leave as "https://api.twilio.com/"
API Parameters: enter "From=" followed by your Twilio phone number from the previous step, in international format with no spaces. On a second line, enter "mo=1". Twilio will only allow you to send around 200 messages per day from each long number. If you want to send more messages per day and you cannot afford a short code, you can get additional long numbers from Twilio. Include those additional numbers by listing them, separated by a | (the "pipe" character). For example: From=12345051212|19875052323|15675052345. When you include multiple long numbers, one number is chosen at random each time an SMS message is sent. Click Save to create your provider. You can now use CiviSMS to send an SMS message to your phone number (the one you verified in earlier steps). See Everyday Tasks for some ways you can send messages. If you reply to an SMS message, it will be created as an activity on your CiviCRM record. To properly use Twilio as an SMS gateway, you will need a paid account. You can upgrade your account to a full account by clicking "Upgrade" in the top right corner from the Twilio console. Once you have upgraded, your rented phone number will be available for full use, and charged against your Twilio credit. You will now be able to send SMS to any phone number.